You have so much of expectation from this trip, four stars no infact five stars - Tim Allen, John Travolta, Martin Lawrence, William H. Macy, Ray Liotta, Marisa Tomei. You will expect a great comedy adventure movie and with such stars throwing their weight around. Well, that’s where the whole problems start – expectation. If you assume these stars, these very stars when the script demands, can outwit their own personal style and create something legendary, they are so capable for doing it. I am sure, you will agree with me, but if you watch Wild Hogs, you will wonder as if they have taken a vacation of sorts in this film. The script came along when they were about the start their bikes, they looked at each other and said, "Let’s do it, we are driving anyway in that direction"
Can’t blame the actors can we? They just wanted a good long ride mired with excitement and adventure. Ray Liota also hoped in with his unbelievable tattoo. But I must add, to the lackluster script, these stars on vacation put on a lot of effortless effort and this film is still enjoyable. Amazing!! Really ludicrous after how much water the script holds. There are some sequences which are particularly funny and enchanting. Marisa Tomei is one attraction in the film for sure, even at 42; she is quite a hottie. The film as lots of moral lessons to deliver, but if you on a vacation and want to carry a DVD, but you are very choosy about the stars acting in it, take my advice take this DVD. As the stars did it too, gave it a try as they were anyway going on vacation. 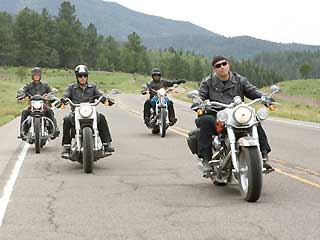 The "Wild Hogs" is a motorcycle gang comprised of four middle-aged suburban men: dentist Doug Madsen (Tim Allen), unemployed Woody Stevens (John Travolta), emergency sewage engineer Bobby Davis (Martin Lawrence), and computer engineer Dudley Frank (William H. Macy). When the tedium of everyday life gets them down, they decide to jump on their bikes and take a road trip, leaving behind bills, jobs, and families in favor of a week on the open road. Unfortunately, along the way, the run afoul of a real motorcycle gang - the "Del Fuegos", led by a nasty piece of work named Jack (Ray Liotta). The Hogs escape from the encounter with all but their dignity intact and end up in the small New Mexico town of Madrid. There, as Dudley woos Maggie (Marisa Tomei), the owner of a diner, and the other three engage in a game of "slap the bull," stormclouds gather. It seems the Del Fuegos know where their quarry is hiding out, and they scent blood.